The Burning Of Rome, 64 A.D. In the fourth and fifth centuries an invasion of nomadic tribes exploded out of the steppes of Central Asia into Europe throwing the Roman Empire into disarray and eventually destroying it. The Huns arrived in Europe around 370 and settled in modern-day Hungary. Their appearance forced the resident Visigoths, Ostrogoths and other Germanic tribes to move westward and southward and into direct confrontation with the Roman Empire. "And though they do just bear the likeness of men (of a very ugly pattern), they are so little advanced in civilization that they make no use of fire, nor any kind of relish, in the preparation of their food, but feed upon the roots which they find in the fields, and the half-raw flesh of any sort of animal. When attacked, they will sometimes engage in regular battle. Then, going into the fight in order of columns, they fill the air with varied and discordant cries. More often, however, they fight in no regular order of battle, but by being extremely swift and sudden in their movements, they disperse, and then rapidly come together again in loose array, spread havoc over vast plains, and flying over the rampart, they pillage the camp of their enemy almost before he has become aware of their approach. When in close combat with swords, they fight without regard to their own safety, and while their enemy is intent upon parrying the thrust of the swords, they throw a net over him and so entangle his limbs that he loses all power of walking or riding." The most famous leader of the Huns was Attila, whose name even today - 1500 years after his death - conjures up visions of evil savagery and whom the Romans called the "Scourge of God." He and his brother succeeded their uncle as co-leaders of the Huns in 434. The brother conveniently died (some say he was murdered by Attila) twelve years later. His command now uncontested, Attila aggressively harassed both the Western and Eastern Roman Empires exacting tribute from each as a bribe not to invade. In 451 the Huns plunged into the heart of Europe but were defeated by the Western Romans and their Visigoth allies at the battle of Chalons in France. 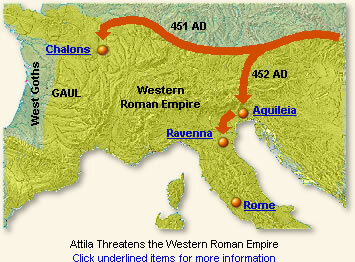 The following year Attila invaded Italy itself, pillaged many of the northern cities and threatened Ravenna. Attila left Italy before accomplishing his task and died, sparing Rome from further attack. In the Presence of the "Scourge of God"
"When we had returned to our tent, Orestes' father came to say that Attila invited both parties of us to dine with him about 3 o'clock that afternoon. We waited for the time of the invitation, and then all of us, the envoys from the Western Romans as well, presented ourselves in the doorway facing Attila. In accordance with the national custom the cupbearers gave us a cup for us to make our libations before we took our seats. When that had been done and we had sipped the wine, we went to the chairs where we would sit to have dinner. All the seats were ranged down either side of the room, up against the walls. In the middle Attila was sitting on a couch with a second couch behind him. Behind that a few steps led up to his bed, which for decorative purposes was covered in ornate drapes made of fine linen, like those which Greeks and Romans prepare for marriage ceremonies. I think that the more distinguished guests were on Attila's right, and the second rank on his left, where we were with Berichos, a man of some renown among the Scythians (the ancient Greek name for the nomads of Central Asia), who was sitting in front of us. Onegesios was to the right of Attila's couch, and opposite him were two of the king's sons on chairs. The eldest son was sitting on Attila's own couch, right on the very edge, with his eyes fixed on the ground in fear of his father. When all were sitting properly in order, a cupbearer came to offer Attila an ivy-wood bowl of wine, which he took and drank a toast to the man first in order of precedence. The man thus honored rose to his feet and it was not right for him to sit down again until Attila had drank some or all of the wine and had handed the goblet back to the attendant. The guests, taking their own cups, then honored him in the same way, sipping the wine after making the toast. One attendant went round to each man in strict order after Attila's personal cupbearer had gone out. When the second guest and then all the others in their turn had been honored, Attila greeted us in like fashion in our order of seating. A lavish meal, served on silver trenchers, was prepared for us and the other barbarians, but Attila just had some meat on a wooden platter, for this was one aspect of his self-discipline. For instance, gold or silver cups were presented to the other diners, but his own goblet was made of wood. His clothes, too, were simple, and no trouble was taken except to have them clean. The sword that hung by his side, the clasps of his barbarian shoes and the bridle of his horse were all free from gold, precious stones or other valuable decorations affected by the other Scythians. As twilight came on torches were lit, and two barbarians entered before Attila to sing some songs they had composed, telling of his victories and his valor in war. The guests paid close attention to them, and some were delighted with the songs, others excited at being reminded of the wars, but others broke down and wept if their bodies were weakened by age and their warrior spirits forced to remain inactive. After the songs, a Scythian entered, a crazy fellow who told a lot of strange and completely false stories, not a word of truth in them, which made everyone laugh. Following him came the moor, Zerkon, totally disorganized in appearance, clothes, voice and words. By mixing up the languages of the Italians with those of the Huns and Goths, he fascinated everyone and made them break out into uncontrollable laughter, all that is except Attila. He remained impassive, without any change of expression, and neither by word or gesture did he seem to share in the merriment except that when his youngest son, Ernas, came in and stood by him, he drew the boy towards him and looked at him with gentle eyes. I was surprised that he paid no attention to his other sons, and only had time for this one. But the barbarian at my side, who understood Italian and what I had said about the boy, warned me not to speak up, and said that the seers had told Attila that his family would be banished but would be restored by this son. After spending most of the night at the party, we left, having no wish to pursue the drinking any further." Priscus, Dinner with Attila, translated in Robinson, J. H., Readings in European History (1905); Gibbon, Edward, The History of the Decline and Fall of the Roman Empire (1896-1902); Thompson, E.A., A History of Attila and the Huns (1948). "Dining With Attila the Hun, 448," EyeWitness to History, www.eyewitnesstohistory.com (2003). Ironically, Attila, although a savage warrior, did not lose his life in battle. He died in his own bed in 453 due to the loss of blood from what many believe to be a massive nose bleed.